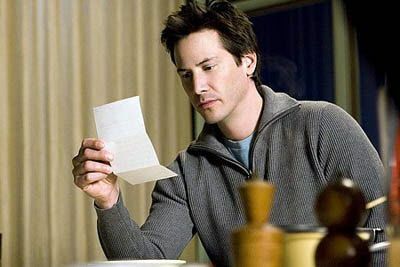 Set up to be the fall guy in a bank robbery he didn’t commit, aimless Buffalo toll-booth operator Henry (Keanu Reeves) is sentenced to three years in jail. Upon leaving, he feels aggrieved at the injustice – “I did the time, I may as well have done the crime” – and decides to rob the bank anyway, with the help of his erstwhile cellmate Max (James Caan). This comes after they discover an ancient tunnel between the bank’s vault and a nearby theatre, where a production of Chekhov’s The Cherry Orchard is in rehearsals. So far, so Small Time Crooks. But then the film goes all Vanya On 42nd Street on us (well, sort of), as Henry and Max worm their way backstage. The only way to gain access to the tunnel is for Henry to secure a certain dressing room – and the role of Lopakhin. Thrown into the mix is a love affair between Henry and leading actress Julie (Vera Farmiga), some foot-stomping from the play’s Russian director (Peter Stormare, over-acting as if his life depended on it) and a bank security guard (Bill Duke) who wants his revenge on his ungrateful employers. Following his London low-life tale 44 Inch Chest, director Malcolm Venville delivers another movie that puts the accent on acting. It’s heartening to see the players enjoying their craft – especially Caan, whose touching portrayal of an old lag feels like a softer-hearted version of his criminal in Bottle Rocket. Farmiga gives another cool turn, familiar to anyone who saw Up In The Air, while Reeves’ quietly studied performance takes you back to the days of My Own Private Idaho. Alas, there’s little of the exuberance Sacha Gervasi (co-scripting here) captured in his outstanding rock-doc Anvil! to be found here. Neither funny enough to be an out-and-out comedy nor tense enough to work as a thriller, Venville instead cuts between the heist and opening night in the final third in the hope of teasing out some significance. Like watching Reeves playing Chekhov, it’s a bit of a stretch.